Completed applications can be returned to the MD of Pincher Creek No 9 Administration Office located at 1037 Herron Avenue, via mail to Box 279, Pincher Creek, Alberta T0K 1W0, fax to 403-627-5070 or e-mail to info@mdpinchercreek.ab.ca. Please call the MD Office at 403-627-3130 should further information or clarification be required. Now that August has arrived, organizations and groups should be looking ahead and applying for joint funding for any projects coming up in 2019, as the application deadline is Sept 12. Applications are always done in the fall before budgeting. Joint funding is an opportunity for organizations requiring extra funding to help with their projects. It was created to co-ordinate requests from groups to both the Town and the MD of Pincher Creek, and allows both to be involved in the community. Any organization can apply for joint funding using the application form available at the town and MD websites or at their administrative offices, and submitting via email or in person to the offices. Projects that have received funding range from sponsorships for events, to helping with operational projects, to assisting to fund the annual parade during the Pincher Creek Pro Rodeo weekend. The application form needs to be completed in full, including details of the funding request and project. The application is then reviewed by both town and MD councils, and they decide which projects will receive funding, and how much. Projects will receive all they asked for, only part, or none, depending on the councils’ decision. It’s also important to note that a project may receive funding one year but not another year, depending on the merit of the project and what other applications have been received. Joint funding can be given to as many organizations as the councils decide. The agreement between the town and the MD provides a combined base amount of about $30 per capita, which works out to around $198,000 available for funding. Sometimes, depending on the number of projects or funding needed, the town and the MD will add more to the base amount. In the application, a question asks whether the group or project qualifies for Family and Community Support Services, and the answer could possibly determine whether the group receives joint funding. FCSS is a municipal and provincial joint program that provides funding for preventive social services. If the project in question is for the well-being of, say, family and youth support, then FCSS also has funding abilities that could help, and joint funding may not be needed. 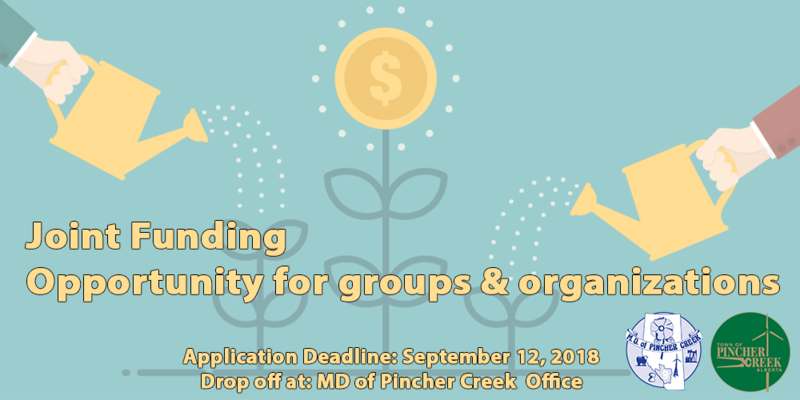 Also, Pincher Creek’s new grant specialist, Liza Dawber, can help organizations find funding elsewhere, help them collaborate with other community groups, or do a bigger project. It is a choice for groups to talk to Liza, but she is happy to assist them with their search for funding.